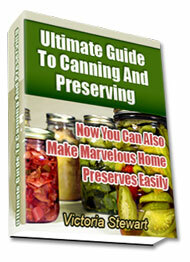 A lot of people love to can their own food from home through the use of pressure canning or the water bath technique in preserving fresh garden harvest, depending on the type of food that is processed. Now there are various home canning equipment pieces which will make your job easier. Certainly, you will need a canner. Here is a canning tip ñ choose the wing nut system and pass up on canners or pressure cookers which contain plastic gasket fastener. The seal, in due course, wear out and crack, needing replacement. With wing nut system, no gaskets need replacement. Be sure to put your home canning equipment, especially the canner parts, altogether so that you will not be looking for them from time to time and to avoid loss. Always check your pressure gauge, wing nuts, pressure regulator and other supplies. A canner or pressure cooker that is lacking a vent regulator will only be useless, so be sure to keep this item as it is easy to lose and very small. When storing them, keep the loose parts within the canner and let them stay there. As a part of your home canning equipment, provide jars which are made for their function. Some glasses can break down in high heat, so it is best to buy Kerr or Mason glass canning jars which are purposely made for boiling bath and pressure canning. Other than the canner, you will also need screw bands and metal lids. The metal lids must be used once then discarded after the contents have been consumed. Additionally, screw bands could be used repeatedly. They are removed right after the content becomes cool, after the vacuum seal is attained and the packed canning jars are stored along with only the metal lid. Your home canning equipment and utensils must be stainless steel or anodized aluminum. Stay away from galvanized zinc, brass, copper and cast iron because these materials retort with acids and salts in the food. Other usual home canning equipment are colander, durable saucepans and pots, cutting board, potato peeler, knives, heat-resistant spoons and ladle, measuring cups and spoons in varied sizes, a large-size mixing bowl and funnel that is specifically-designed for jars. When canning foods, your home canning equipment should also include the magnetic cover wand, dry kitchen towels, kitchen tongs, a non-metal spatula to remove air bubbles, air lifter which is a very handy tool for securely removing the jars from the boiling water, strainer, cheesecloth, permanent marker, thermometer, labels which are usually included in canning jar boxes, kitchen scales, correct kitchen timer, spice bags and a notebook or journal for making notes, recording recipes and other notes.